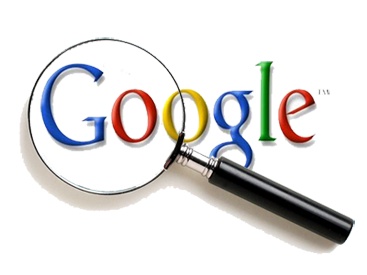 The Google Custom Search WordPress Plugin uses Google’s search engine to search your site’s contents! WordPress has a relatively good search functionality but tends to get sluggish and doesn’t match keywords that well. This is even more apparent when your site is quite large and you have many posts and/or pages. In addition, wordpress search functionality display results ordered by date and not by its relevance to the keywords. Also Google Custom Search Engine is not limited to just your site. You can configure it through google to search multiple sites/domains. 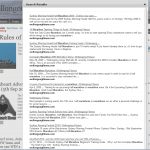 Or how about having a search Engine with searches all websites within your blog’s niche? Combining Google’s search engine along the familiarity of their interface, this is a must have plugin for all websites. The plugin is very flexible and you can configure the both the search box and the search results. Google Custom Search widget’s search box can be displayed as either a widget or placed anywhere in the code. 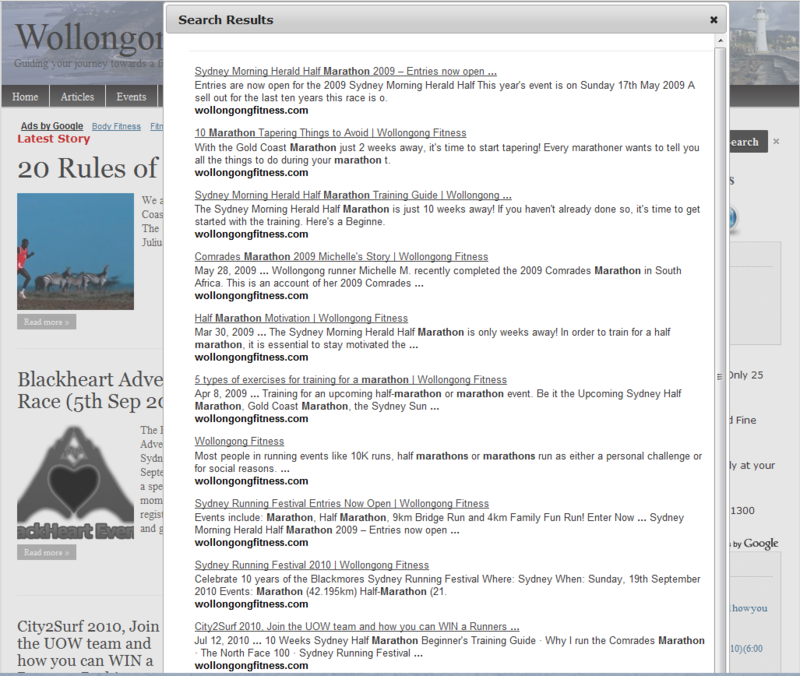 The search results can be displayed in one of three formats. Displayed anywhere in the code. Little Handy Tips – We use the plugin on our own site to display the search results as a pop-up dialog. 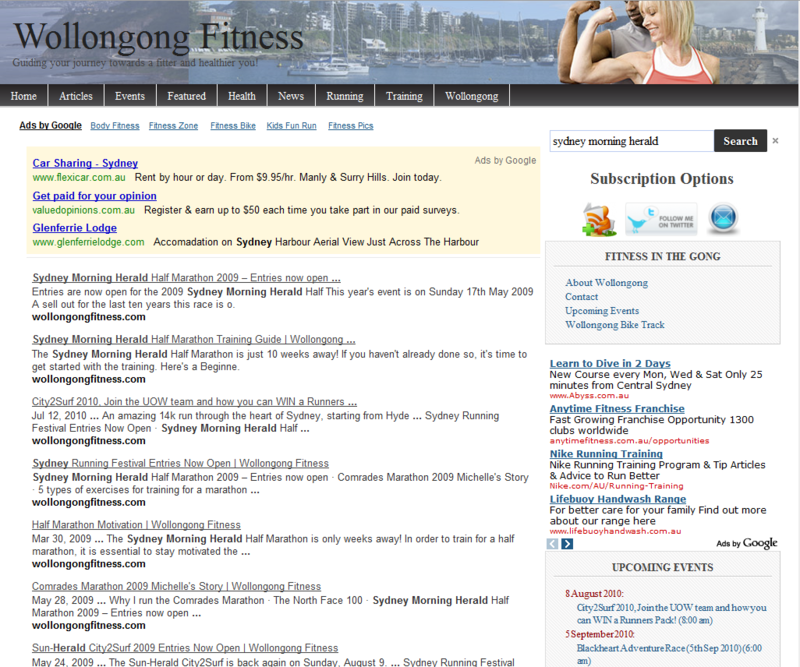 Wollongong Fitness – A fitness website which has the display of the search results customized to be displayed in a different place. If you find the Google Custom Search Engine WordPress Plugin useful, show your support and make a donation. This section describes how to install the google custom search engine wordpress plugin and get it working. Upload the folder `google-custom-search` to the `/wp-content/plugins/` directory. *You might need to setup a Custom Search Engine Account with Google. where $display_results_option is one of the following three options. Added option to not display search button. Q. Does this plugin replaces the wordpress plugin? You can choose to have it replace wordpress’s search but removing their search and putting this plugin instead. Q. My current website search box is not in a widget. Can I replace wordpress search with this plugin? Q. How do I specify where the search results are to be displayed? The search results can be configured within the widget to display in one of three options. If you want to specify the location for the results to be displayed, you will need to do the following. Add the following line of code into your wordpress theme at where you want to results to be displayed. Q. Can Google Custom Search search other/multiple websites? Q. How do I create a Google Custom Search Engine? Sorry as the support forum has been getting too many spam, I had to take it down. If you’re having problems with getting the plugin to work, take a look at 3 Easy Steps to Diagnose WordPress Plugin Problems. Also even though the plugin is free, providing support can be time-consuming. Therefore if you like to make a donation, it will be greatly appreciated. I don’t always have time to respond to all support requests, but if you make a donation, I will make your question a priority. Thanks.